The Cellist of Sarajevo is a spare and haunting, wise and beautiful novel about war and the endurance of the human spirit and the subtle ways individuals reclaim their humanity. In a city under siege, four people whose lives have been upended are ultimately reminded of what it is to be human. From his window, a musician sees twenty-two of his friends and neighbors waiting in a breadline. Then, in a flash, they are killed by a mortar attack. In an act of defiance, the man picks up his cello and decides to play at the site of the shelling for twenty-two days, honoring their memory. Elsewhere, a young man leaves home to collect drinking water for his family and, in the face of danger, must weigh the value of generosity against selfish survivalism. A third man, older, sets off in search of bread and distraction and instead runs into a long-ago friend who reminds him of the city he thought he had lost, and the man he once was. As both men are drawn into the orbit of cello music, a fourth character—a young woman, a sniper—holds the fate of the cellist in her hands. As she protects him with her life, her own army prepares to challenge the kind of person she has become. Steven Galloway, a Canadian author, was born in Vancouver and raised in Kamloops, both in British Columbia. He attended the University College of the Cariboo and the University of British Columbia. His debut novel, Finnie Walsh (2000), was nominated for the Amazon.ca/Books in Canada First Novel Award. His second novel, Ascension (2003), was nominated for the BC Book Prizes' Ethel Wilson Fiction Prize, and has been translated into numerous languages. His third novel, The Cellist of Sarajevo (2008), was heralded as "the work of an expert" by the Guardian, and has become an international bestseller and sold in 20 countries. Galloway has taught creative writing at the University of British Columbia and taught and mentored creative writing in The Writer's Studio, at the writing and publishing program at Simon Fraser University. His work has been published in over thirty countries and optioned for film. Galloway teaches Creative Writing at the University of British Columbia and lives in Vancouver, Canada. 1. What effect does the constant confrontation of war and occupation have on each narrator? Does suffering, violence and loss ever become normalized for them? What is it like to live in this kind of anarchy—especially when symbols of peace and power have been extinguished (the eternal flame from WWII, the Kosovo Olympic stadium now used as a burial ground)? And what does it mean to have the color, beauty, and vibrancy of music and flowers (left behind for the cellist) introduced? 2. How has life changed in the city since the arrival of the men on the hills? What resources, both physical and mental, are the four characters in the book using to help them survive? What is involved in day-to-day living? How would you fare under these same conditions—and what would be your greatest challenges? 3. Each chapter in the novel is told through the lens of one of the four main characters (including the cellist) in the story. How does this strategy color our reading? How might our experience be different if told in first person? If it were told in a more journalistic way? 4. How do each of the narrators (Arrow, Dragan, Kenan) view their fellow citizens? How do they each look upon their struggles, choices, and their attitudes? What makes them not give up on each other? Does Kenan’s classification of the “three types of people” (144) ring true to you? 5. Do you think the author intends for the reader to be sympathetic to Arrow’s life and career trajectory? What prevents (or encourages) us from fully engaging, trusting, relating to her? Do you think war forces everyone to compromise something in themselves—their attitude, their moral compass? 6. What are the goals of “the men on the hill”? What exactly is it they are trying to destroy? What do they come to represent for the main characters—and what separates them from Arrow? 7. In the beginning of the novel, Dragan is said to avoid his friends and coworkers because “the destruction of the living is too much for him,” Arrow assumes a new name to distance herself from her role as a sniper, and Kenan takes refuge in his new ritual of obtaining water for his family. How have the three used rituals as ways to cope with their fear of what is happening in the city? At the end of the book, do you feel that their experiences of the cellist’s performances have changed how they deal with the danger around them? In what way? 8. What force does music have upon the war torn state—and what powers does it have over the lives of the characters? (For Kenan, Arrow, and Dragan? For the cellist himself?) Do you find yourself relating to the power of the cellist’s performances? Are there parallel moments in your life where you also experienced such sudden awakening, or realization? 9. “Sarajevo was a great city for walking.” How does the mapping of the landscape—the physical and psychic layout of the city—affect the narrative? How does our intimacy with this map affect our experience of the story? 10. In one of his early chapters, Kenan is particularly disturbed by the interruption and shelled state of the tram’s service (“The war will not be over until the trams run again”) and the destruction of the National Library (“the most visible manifestation of a society he was proud of”)—representing for him basic civilization. What signs, services, and signals do you consider pillars of civilization? 11. Why do you think the sniper avoids taking his shot at the cellist—especially when he has such ample opportunity? 12. Why does Dragan take such drastic measures to prevent the dead man’s body from being filmed by the journalist? What does the author suggest through this as a lesson for the living? What are we to do to prevent the horror of war from becoming commonplace, something to tune our televisions out from? 13. Were you surprised by Arrow’s final act of protest? Do you think she was ultimately able to reclaim herself, her identity? Do you think she succeeded? 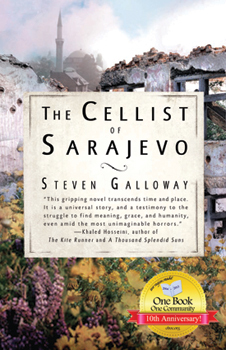 The cellist in Galloway's novel is based on a real person and an incident that occurred during the siege of Sarajevo. Vedran Smailović is a musician from Bosnia and Herzegovina and a former cellist in the Sarajevo String Quartet. On May 27, 1992, a mortar attack killed 22 people waiting in a bread line in Sarajevo. To protest the attack and inhonor of the dead, Smailović, in full evening dress, played his cello in the rubble every day for 22 days. He escaped from Sarajevo in 1993 and now lives in Northern Ireland. Smailović objected to Galloway's portrayal of the cellist in his fictional account of the siege and felt, because his story was being used without his permission or knowledge, he was entitled to a share of the profits from the book. Galloway disagreed, arguing the novel is a work of fiction and he is entitled to write a fictional account of a real event. Further, Galloway is not telling the cellist's story; his cellist is a minor character in the novel through whom the stories of the three main characters intersect. Galloway and Smailović met in 2012 to discuss their differences and reach an understanding (see link to article below). A June 17, 2008 article from The Australian by David Sharrock about Smailovic's reaction his portrayal in Galloway's book. A CBC News article on the controversy surrounding the cellist's character in Galloway's book. A January 2012 article about Smailovic's meeting with Galloway to attempt to reconcile their differences. Albinoni was an Italian composer known mainly for his instrumental music. From a wealthy family and a trained musician, he preferred the life of a dilettante and spent his time creating and enjoying music rather than working in his father's stationer's business or seeking a post in the court or church. His work consisted mainly of instrumental ensemble music (sonatas and concertos) and secular vocal music (operas and solo cantatas). In his day, Albinoni's instrumental music was in great demand in Europe, especially among amateur musicians, and his work was considered on par with leading composers of the period, Corelli and Vivaldi. His operas were performed in various Italian cities between 1694 and 1720, and outside Italy from the 1720s on. He retired from music in 1741 and died ten years later. Albinoni is said to have possessed "remarkable melodic gifts" which enabled him to continue his success as a composer of operas long after the popularity of his contemporaries faded. The Adagio in G Minor, also known as Albinoni's Adagio, was created by Remo Giazotto, a 20th Century Italian musicologist, allegedly from a manuscript fragment of an Albinoni sonata. A brief biography of composer Tomaso Giovanni Albinoni. The Website of the City of Sarajevo. Country profile and history from the U.S. Department of State. Up-to-date country profile from the CIA. A profile of the independent state of Bosnia-Hercegovina from BBC News. The 20th anniversary of the siege of Sarajevo was in April, 2012. These are a few of the excellent resources available on the Web about the anniversary and post-siege life of the survivors. An excellent article from BBC World News with map, timeline, images and videos. Warning: Videos Contain Disturbing Images. A briefing note from the Office of the United Nations High Commissioner for Refugees. An article from Christian Science Monitor. Part of a PBS special, "the the moving story of how a group of 16 women who had been imprisoned by Serb-led forces in the Bosnian town of Foca broke history’s great silence – and stepped forward to take the witness stand in an international court of law."